Assemble at the airport for your flight to Siem Reap- a small colonial town, charming and pleasant enough to roam around, with some fine examples of French colonial architecture. 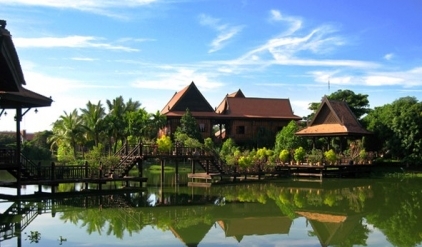 Upon arrival, welcome by tour guide airport, and transfer for lunch at local restaurant, follow by hotel check-in. 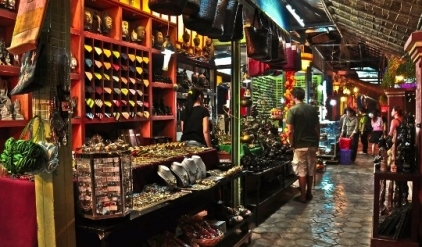 In the afternoon, proceed to visit LE ARTISAN DÁNGKOR CENTER (Angkor Handicraft center, the workshops of wood and stone carving, polychrome lacquering , gilding, silver plating and silk painting, and then discover the fascinating boutique displaying a variety of arts and crafts made by artisans from the workshops using traditional cultural craftsmanship), Next, discover TONLE SAP (The largest fresh water lake in Southeast Asia), enjoy the boat cruise tour, and explore the life of the people living on the floating villages, the fresh water fish display center. 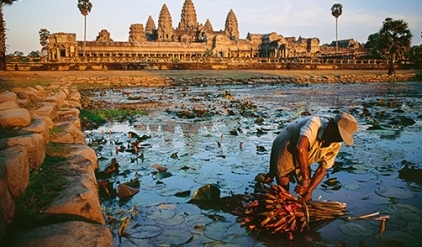 After breakfast, visit the WORLD HERITAGE – ANGKOR WAT. The largest temple in the world with a volume of stones equalizing that of the Cheops Pyramid in Egypt. 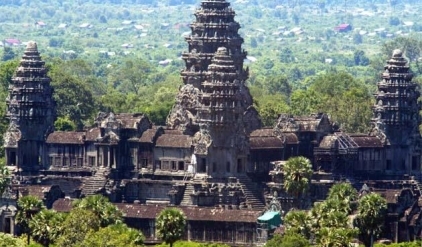 The temple was built by King Suryarvarman II from 1113 – 1150AD when the Khmer civilization was at the height of its development, represent one of humankind's most astonishing and enduring architectural achievements. Afternoon, discover the latest Capital City of Angkor Era, The fortified city of Angkor Thom (Great Angkor or Great City), was built by Angkor’s greatest king, Jayavarman VII (1181 – 1219). We will start from the SOUTH GATE OF ANGKOR THOM, and enter to the main temple sat at the heart of Angkor Thom, the giant faces of BAYON. Next, visit the TERRACE OF THE ELEPHANT, TERRACE OF THE LEPER KING, the PHIMEANAKAS AND BAPHOUN, TA PROHM – a temple in its ‘natural state’. Surround by jungle, its labyrinth of stone hallways is overgrown with the roots and limbs of the massive Banyan trees which envelope the stones tentacles. 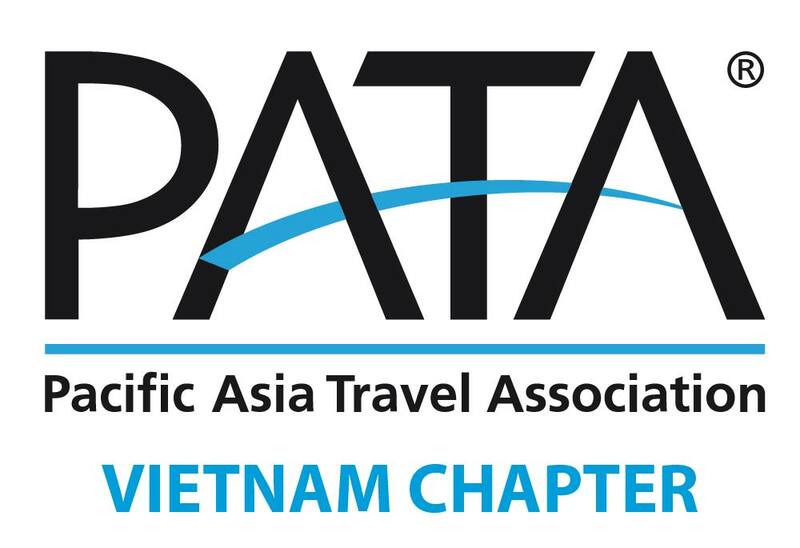 Today, transfer by coach to PHNOM PENH (approx. 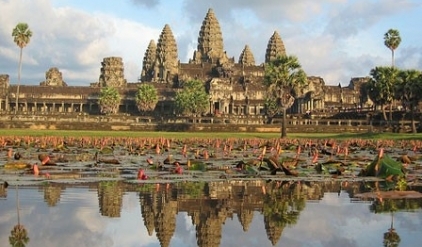 5 hours) - the capital of Cambodia, is the commercial and political hub of Cambodia as well as home to nearly 02 millions of the county’s 15 million people. 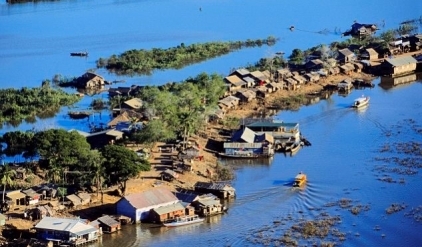 On the way, you will enjoy the beautiful scenery of Cambodia country side, and you will also learn about the life of the people along the provinces which earn their lives from doing daily small business. You might also see people selling FRIED SPIDER and Insects at the halfway stop known for local people as SKON area. 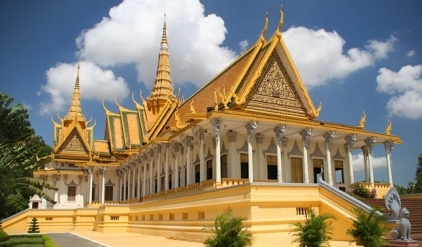 Upon arrival, have lunch and continue the tour to the ROYAL PALACE (proper attire) and SILVER PAGODA. The Royal Palace which is the official residence of present King Norodom Sihamony, consist of several buildings within the gleaming yellow walls of the compound. After which, proceed to visit INDEPENDENCE MONUMENT, and NAGA WORLD –the only biggest casino resort in the middle of Cambodia’s capital. (Offer 10USD cash match play coupon for each travel agent’s visitors). After breakfast, transfer to SIHANOUK VILLE-Main Cambodia’s beach travel destination. 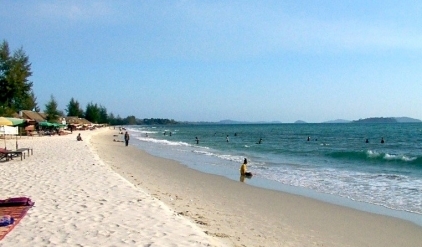 The beaches of Cambodia are enlisted among the most beautiful ones of the world by the Bays of the World’s club. On arrival, visit to INDEPENDENCE SQUARE and GOLDEN LION enjoy the stay and relax on the NATURAL WHITE SAND BEACH. After breakfast at hotel and start your wonderful day private boat trip with SNORKELING, FISHING or simply KICK BACK AND RELAX. The boat trip will explore some near by islands, that colorful corals and fishes can be seen at CHALUH & TAKIEV ISLANDS. Enjoy SWIMMING with fresh and clear water or relax on a long yellow sandy beach with coral reef of BAMBOO ISLAND, BBQ'S LUNCH (Seafood combo) with cool soft drinks and seasonal fruits on the beach. Continue to TRES ISLAND for snorkeling before returning back to Sihanouk Ville. Dinner at local restaurant. After breakfast, transfer from Sihanouk ville to Phnom Penh International Airport. (End of service).